Alkalinity. The only correct answer to the question: What’s the most important parameter to keep in check in order to grow SPS corals successfully? One can argue that pH, temperature, salinity, or even phosphate levels are more important, however, that is true not only for hard corals but for all photosynthetic animals we keep in our aquariums. When it comes to SPS, alkalinity is the fundamental variable that plays a key role in the process of coral calcification. 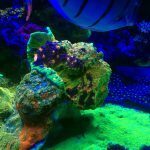 Not only is it crucial for stabilizing the pH of aquarium water, but the bicarbonate compounds that make up “alkalinity” are the building blocks for corals as they adsorb it to build their exoskeletons. As corals increase their hard skeleton mass, the alkalinity of the water drops. The depletion rate depends on a number of factors, including the size of the tank, the sheer mass of stony corals in it, and the rate at which they grow. It’s common knowledge that the higher the depletion rate, the happier the aquarist- indeed, in a healthy reef tank full of stony corals, the alkalinity drops rapidly, more often than not reaching levels that cannot be replenished simply by a water change. Instead, the tank needs to be supplemented with a solution containing alkalinity compounds. 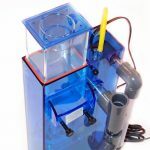 Fortunately, there are several tried and tested methods to dose alkalinity in the tank, the most popular two being dosing an alkalinity supplement (always in conjunction with a calcium supplement) and the use of a calcium reactor to generate alkaline saltwater. 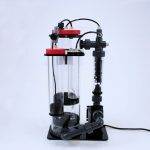 Whatever method of maintaining steady levels of alkalinity in the tank a hobbyist chooses, these levels need to be monitored on a regular basis, because the consequences of instability can be quite dreadful. High alkalinity is especially harmful to the home reef’s inhabitants- fish may lose their protective mucus and be susceptible to bacterial infections, while corals suffer from the shortage of available calcium carbonate, which precipitates from highly alkaline saltwater much faster. On the low end of the spectrum, the lack of available carbonate compounds in the water directly affects coral growth and makes the environment they live in more acidic, which, in extreme cases, may result in coral melting. In a nutshell, alkalinity is important and requires repeated testing and constant knowledge of its uptake by corals in the tank. 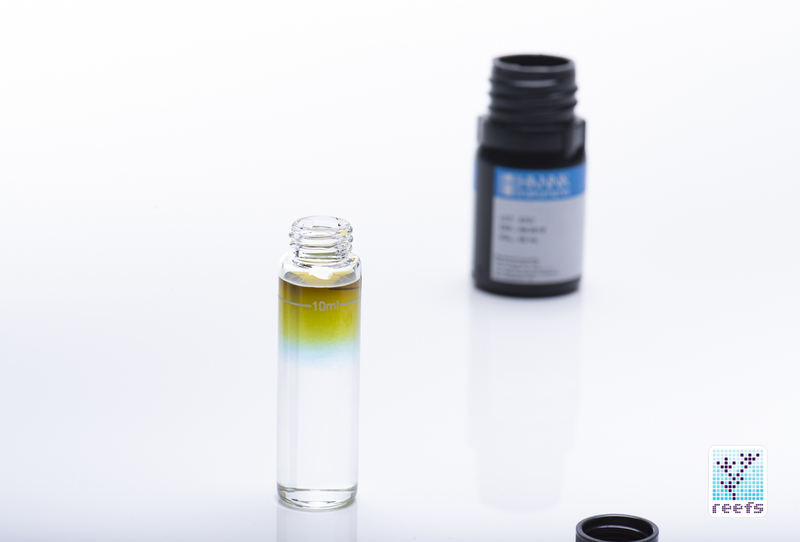 The traditional method of testing for alkalinity is the use of colorimetric titration, where a reagent solution is added to a water sample in precise increments until a known colorimetric endpoint is reached, at which point the water sample changes color. The result is determined by comparing the amount of reagent added until the colorimetric endpoint was reached with the corresponding alkalinity value (in milliequivalents per L units or degrees in dKH scale). It’s a proven, easy to understand and follow methodology that has been vastly improved over the years and nowadays offers a highly accurate result. Hobby level titration kits are a staple of reefkeeping and will probably remain so for years to come, which is fine in my opinion, as they are a good, low-cost option for alkalinity testing. The future, undoubtedly, belongs to automatic alkalinity monitors. Prototypes and working examples of these sophisticated, controller-equipped devices have recently been dominating the floors of aquarium shows, and despite their obvious flaws (high initial cost and steep learning curve), I believe they will ultimately be the preferred method of Alkalinity testing and monitoring for serious reefers. The product I am reviewing today belongs to yet another category, one somewhere in-between the two methods of alkalinity analysis. Hanna Instruments HI755 Saltwater Aquarium Alkalinity Colorimeter is an electronic colorimeter for testing alkalinity in saltwater aquariums. Its main purpose is to bridge the gap between the ease of use found in colorimetric titration test kits and the accuracy of test results that electronic testing equipment can achieve. Because this is my second review of Hanna handheld colorimeters (shameless plug- here’s my Hanna Instruments HC Marine Calcium Checker Definitive Review), I won’t repeat myself explaining how a digital colorimeter works or what the difference is between titration test kits and colorimeters ( check above for link to the original review) and instead jump straight into the unboxing/testing part of the review. 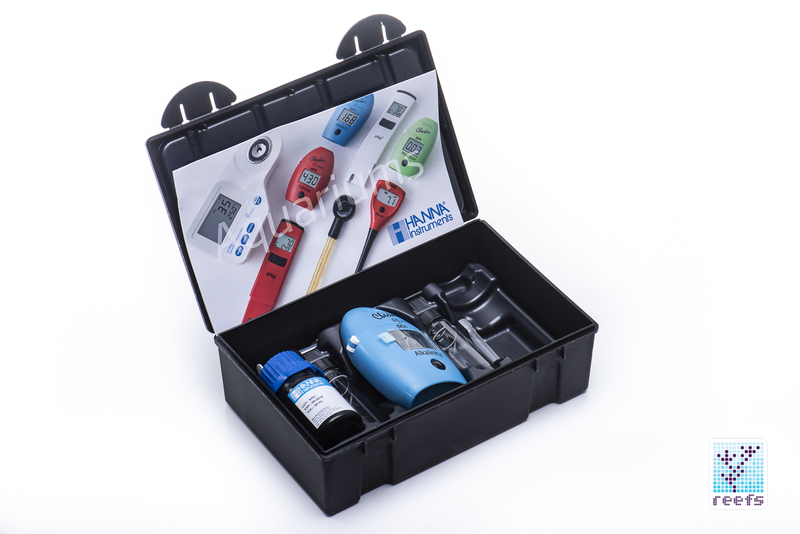 All products in the new line of Hanna Instruments’ handheld colorimeters share the same premium packaging, which consist of an abuse-proof plastic case equipped with a custom mold that holds all components of the test kits securely inside. 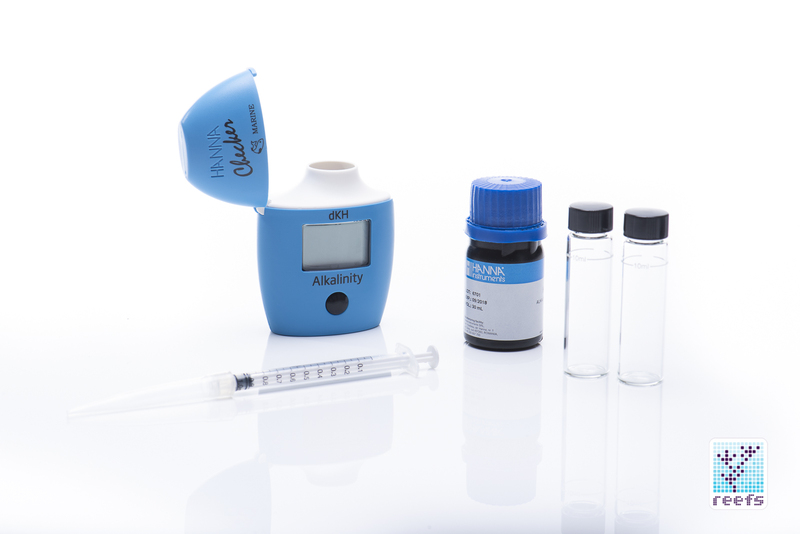 The content of HI755 is minimal, as it should be- we have the colorimeter itself, supplied with one AAA battery, two glass cuvettes with lid, a 1mL marked syringe, a 30ml bottle of reagent solution, good for 25 tests, and a laminated, splash-proof instruction card. The colorimeter, for those familiar with the line, looks identical to other handheld devices Hanna makes, minus the distinctive blue color of the plastic enclosure. There is a single-row alphanumeric display that shows the test result and a hinged door on top for accessing the test sample chamber. The single AAA battery that powers the unit is accessible via the bottom cover, held by a phillips head screw. It’s an exact copy of the extremely compact and sturdy design of the other products in Hanna’s handheld colorimeters line. Nothing to complain about here. One of the main advantages of colorimetric titration test kits is their straightforward testing process. 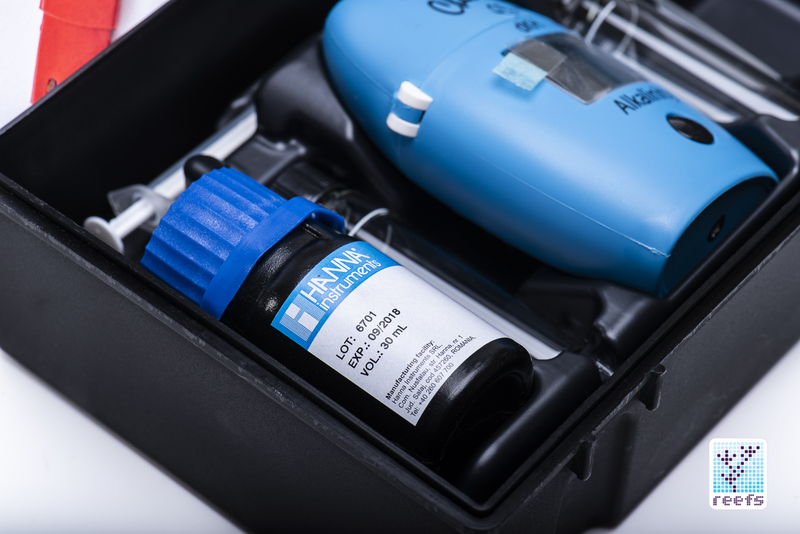 The Hanna HI755 methodology is quite similar, with only three simple steps to follow in the process of measuring alkalinity. Those are: -turn on the unit, wait for “C1” to be displayed on the screen, fill the vial to the 10ml mark with aquarium water, place it in the testing chamber and wait for the colorimeter to zero itself to the new reference solution -add exactly 1ml of reagent to the vial, close the lid, invert the vial a couple of times and place it back into the test chamber, pressing the button on the colorimeter to initiate the testing phase -read the test results on the screen It’s a simple process, and only a little bit more involved than a titration test. The uptake is that we eliminate the biggest obstacle to obtain an accurate test result- human error. Although it’s not as crucial of a factor as in, for example, calcium testing, the ever-present human error can lead to inaccurate test results. Fortunately for those who use titration kits on a regular basis, human involvement in the process of alkalinity testing is less prevalent than when testing for other parameters. Hanna Instruments HI755 advertises accuracy @ 25°C/77°F is ±5 ppm (mg/L) or ±5% of reading, which, in hobby level test kits standards, is highly accurate. To be fair, all good-quality marine test kits available on the market have similar accuracy. The difference between Hanna Cheker and titration kits is two-fold: on one hand, there’s an extra step involved in testing water using HI755- you have to make sure the cuvette is clean and free of previous tests’ residue, but also free of fingerprints and smudges on the outside, as any unwanted materials present in the path between the LED and light detector may skew the test results. On the other, by shifting the actual testing to a microchip equipped machine, we eliminate the most common cause of bad readouts- again, human error. Although determining the result of a titration test is not as ridiculously difficult as, for example, trying to read the color of phosphate test solution against the extremely narrow palette of the accompanying color wheel, there’s still a margin of error one may experience. The conclusion that can be drawn from these two tests is that Hanna HI755 Alkalinity Checker is an accurate instrument, on par with the leading test kit it was examined against. No surprise here, after all, accuracy is the single most important characteristic any test kit must hold to be relevant in this market. Let’s talk about Hanna HI755’s value. 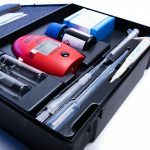 The colorimeter kit, which comes with two cuvettes, a syringe with tip, and a bottle of reagent good for 25 tests, costs $49. That’s almost three times the cost of the earlier-mentioned Salifert test kit, which retails for around $17 and lasts for about 100 individual tests. 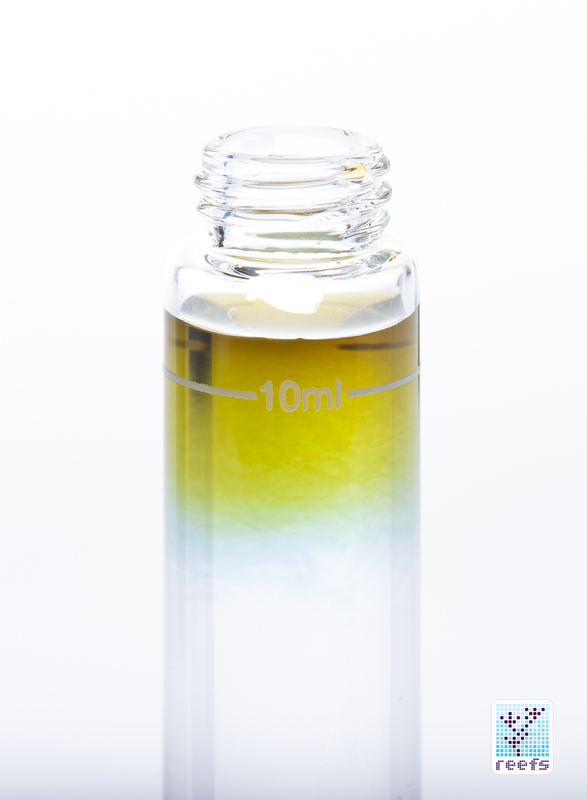 However, Hanna reagent refills cost only $8, where with traditional titration kits, you are forced to buy the entire product every time the reagent runs out (except for the Red Sea Alkalinity test kit, they also sell the reagent kits). Therefore, from a purely monetary standpoint, Hanna HI755 has a high initial cost, which gets “diluted” with prolonged use. That being said, we are comparing apples to oranges here, as Hanna Alkalinity Checker is an entirely different animal compared to colorimetric titration kits and really resides in a category of its own, as there is simply no other device of this type and at this price level available in the hobby. At the end of the day, it’s up to you, the actual user, to determine the true value of Hanna HI755. 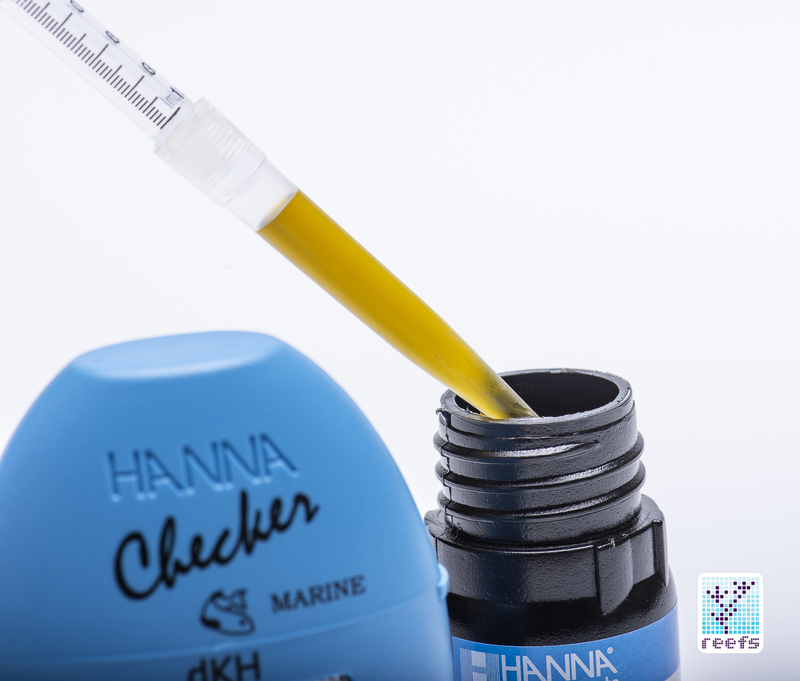 For me, it’s not the overall cost of using this as opposed to titration test kits, because let’s be honest, you need to perform a lot of tests to actually start saving money with Hanna Checker. Instead, the fact that I rely on the precise optical equipment inside the Checker and not on my own imperfect eyesight, is where Hanna Alkalinity Checker’s true value lays. 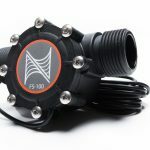 It accompanies the excellent phosphate and calcium checkers I already own and it’s my preferred method of testing alkalinity in the reef aquarium. At least for now, before I get my hands on an automatic alkalinity monitor… then my preference may change. 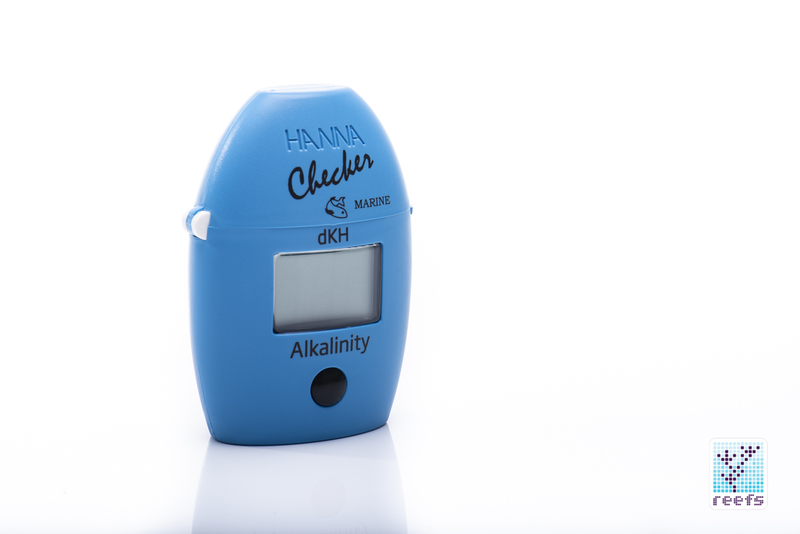 Thanks for reading, please follow the links below to learn more about Hanna HI755 Alkalinity Checker and other products in Hanna Instruments catalog.